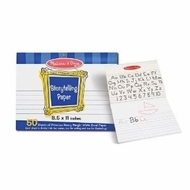 The Melissa and Doug Storytelling Paper Pad is designed for original illustrations and storytelling. Each piece of paper includes a blank section and a lined section for original creations. Each pad includes 50 sheets of premium heavy-weight white bond paper. Its ideal for pencils, markers, paints, chalk, or crayons! Ideal for Pencils, Markers, Paints, Chalk, or Crayons!